While Mary, the Living Ark of the Covenant, is ascending the steps that lead up to the Temple, carrying Jesus in her arms, let us be attentive to the mystery. One of the most celebrated of the prophecies is about to be accomplished. 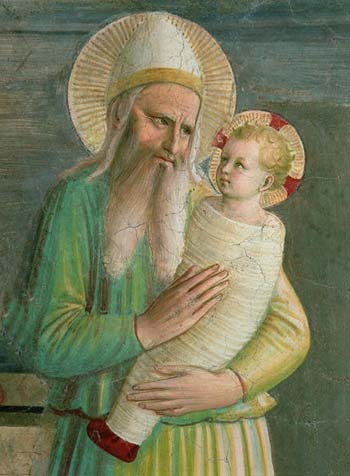 One of the principal characters of the Messiah is about to be shown as belonging to this Infant. We have already had the other predictions fulfilled, of his being conceived of a Virgin and born in Bethlehem. Today, He shows us a further title to our adoration - He enters the Temple. This edifice is not the magnificent Temple of Solomon, which was destroyed by fire during the Jewish captivity. It is the Second Temple, built after the return from Babylon and not comparable to the First in beauty. Before the century is out, it also is to be destroyed; and our Savior will soon tell the Jews, that not a stone shall remain on stone that shall not be thrown down (Lk 21: 6). In order to console the Jews who were grieving because they were unable to raise a House to the Lord equal in splendor to that built by Solomon, the Prophet Aggeus addressed these words to them that mark the time of the coming of the Messiah: “Great shall be the glory of this House, more than of the first; and in this place I will give Peace, saith the Lord of Hosts” (Agg. 2:10). The hour is come for the fulfillment of this prophecy. The Emmanuel has left Bethlehem. He has come among the people; He is about to take possession of His Temple, and the mere fact of His entering it will straightaway give it a glory far above that of its predecessor. He will often visit it during his mortal life; but His coming to it today, carried as He is in Mary’s arms, is enough for the accomplishment of the promise, and all the shadows and figures of this Temple at once pale before the rays of the Sun of Truth and Justice. The blood of oxen and goats will, for a few years more, flow on its altar. But the Infant, who holds in his veins the Blood that is to redeem the world, is at this moment standing near that very Altar. Amidst the Priests and amidst the crowd of Israelites who are moving to and fro in the sacred building, there are a few faithful ones who are awaiting the Deliverer, and they know that the time of His manifestation is at hand. But there is not one among them all who knows that, at that very moment, this expected Messiah is under the same roof with himself. But, this great event could not be accomplished, without a prodigy being wrought by the Eternal God, as a welcome to His Son. There was then living in Jerusalem an old man whose life was well nigh spent. He was a Man of desires (Dan 10: 11), and his name was Simeon. His heart had longed unceasingly for the Messiah, and at last his hope was recompensed. The Holy Ghost revealed to him that he should not see death without first seeing the rising of the Divine Light. As Mary and Joseph are ascending the steps of the Temple to take Jesus to the Altar, Simeon feels within himself the strong impulse of the Spirit of God. He leaves his house and walks towards the Temple. The ardor of his desire makes him forget the feebleness of age. He reaches the porch of God’s House and, there, amidst the many mothers who had come to present their children, his inspired gaze recognizes the Virgin, of whom he had so often read in Isaiah. He presses through the crowd to the Child she is holding in her arms. Mary, guided by the same Divine Spirit, welcomes the saintly old man and puts into his trembling arms the dear object of her love, the Salvation of the world. Happy Simeon! figure of the ancient world, grown old in its expectation and near its end. No sooner had he received the sweet Fruit of Life, than his youth is renewed as that of the eagle, and in his person is wrought the transformation that was to be granted to the whole human race. He cannot keep silence – he must sing a Canticle. He must do as the Shepherds and Magi had done and give testimony: “Now,” says he, “now, O Lord, thou dost dismiss thy servant in Peace, because my eyes have seen thy Salvation, which thou hast prepared – a Light that is to enlighten the Gentiles and give glory to thy people Israel” (Lk 2:29). Immediately, there comes, attracted to the spot by the same Holy Spirit, the holy Anna, Phanuel’s daughter, noted for her piety and venerated by the people on account of her great age. Simeon and Anna, the representatives of the Old Testament, unite their voices and celebrate the happy coming of the Child, who is to renew the face of the earth. They give praise to the mercy of Jehovah, who, in this place, in this Second Temple, gives Peace to the world as the Prophet Aggeus had foretold. This was the Peace so long looked forward to by Simeon and, now, in this Peace will he sleep. Now, O Lord, as he says in his Canticle, thou dost dismiss thy servant according to thy word in Peace! His soul, quitting its bond of the flesh, will now hasten to the bosom of Abraham and bear to the elect, who rest there, the tidings that Peace has appeared on the earth and will soon open Heaven. Anna has some years still to pass on earth. As the Evangelist tells us, she has to go and announce the fulfillment of the promises to such of the Jews as were spiritually minded and looked for the Redemption of Israel (LK 2:38). The divine seed is sown. The Shepherds, the Magi, Simeon and Anna have all been its sowers. 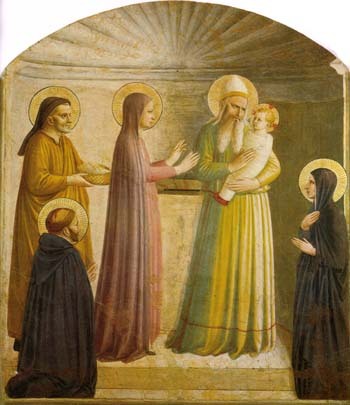 Simeon gives back to Mary the Child she is going to offer to the Lord. The two doves are presented to the Priest, who sacrifices them on the Altar. The price for the ransom is paid; the whole law is satisfied. And, after having paid her homage to her Creator in this sacred place where she spent her early years, Mary, with Jesus fastly pressed to her bosom and her faithful Joseph by her side, leaves the Temple. Such is the mystery of this 40th day, which closes, by this admirable Feast of the Purification, the holy season of Christmas. Several learned writers, among whom we may mention Henschenius and Pope Benedict XIV, are of opinion that this Solemnity was instituted by the Apostles themselves. This much is certain, that it was a long established Feast even in the 5th century. The Greek Church and the Church of Milan count this Feast among those of Our Lord, but the Church of Rome has always considered it as a Feast of the Blessed Virgin. It is true, it is our Savior who is this day offered in the Temple. But this offering is the consequence of our Lady’s Purification. The most ancient of the Western Martyrologies and Calendars call it The Purification. The honor thus paid by the Church to the Mother tends in reality to the greater glory of her Divine Son, for He is the Author and the End of all those prerogatives that we revere and honor in Mary. Why Is Her Feast on February 2?